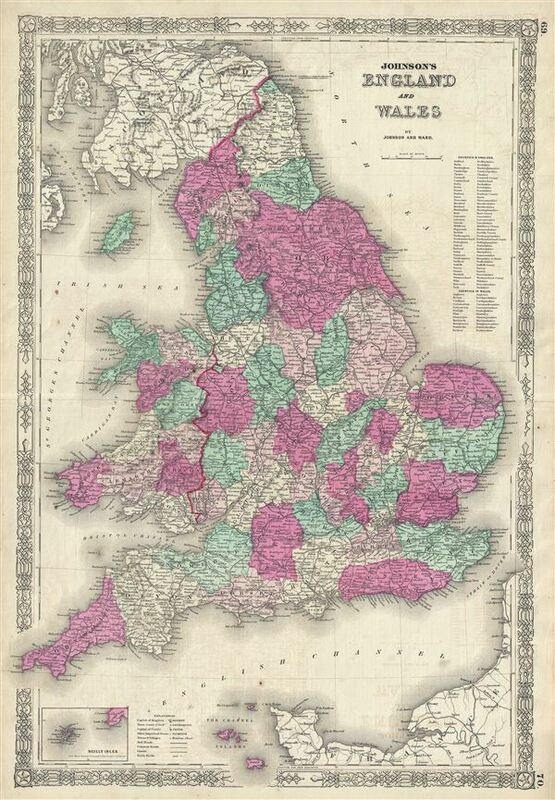 This is Johnson and Ward's 1863 map of England and Wales. The map covers both England and Wales in full from Scotland south to the English Channel and The Channel Islands, and from St. George's Channel to the mouth of the Thames River, including the Isle of Man. The upper right hand quadrant includes a list of counties in England and Wales respectively. The lower left hand quadrant offers an inset of the Scilly Isles. During this time, both England and Wales were in the midst of the Industrial Revolution wherein much of the rural agricultural population relocated to urban centers. The map is color coded according to regions and notes several towns, cities, rivers, and various other topographical details with relief shown by hachure. It features the fretwork style border common to Johnson's atlas work from 1863 to 1869. Published by Johnson and Ward as plate nos. 69-70 in the scarce 1863 edition of Johnson's Family Atlas. Very good. Text on verso. Minor wear along original centerfold. Minor offsetting. Rumsey 0352.040 (1860 edition). Philips (atlases) 843.